The majestic mountains, beautiful landscapes, and the primeval beaches are the main attractions of the Ireland’s Achill Island. This Island has always been a popular European tourist destination. However, since mid-April, the rugged 57-square mile island with nearly 2,600 residents has gained worldwide fame thanks to the ‘Magical’ return of the beach which washed away over three decades ago. 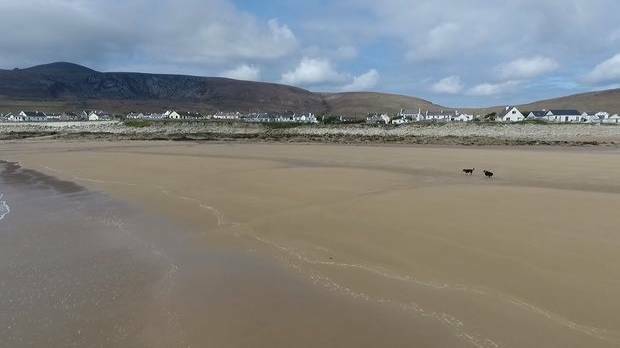 While the residents of County Mayo's Achill Island which is known as one of the largest islands off the coast of Ireland were surprised by seeing the stunning transformation that took place overnight. However, the beach was returned to its earlier glory after a freak tide dumped thousands of tons of sand along 1,000 feet of the seashore. The Dooagh Beach which was once a beautiful destination for many. Did you know that this beach was washed away completely not leaving anything after a huge winter storm hit the area in the year 1984? The damage was unforgettable until recently as it rolled away everything along with the beauty of the place and even many people lost their homes. There was, even more, damage done after two storms rolled in back one after one in 2014, abolishing access points to the beach and washed away a road to a nearby pier. The citizens and operators of local tourism groups are in a hope that the sandy beach is here to stay. No one knows how it happened, but around April this year, something magical happened and an unusual ten-day tide encased the barren 300 meter which is a 984-foot stretch of rock beach with hundreds of tons of soft golden sand! While the scientists from the National University of Ireland, Galway suspect that this sand had been gathering offshore for months and was transported to the beach by the high winds and great waves. The restored beach is attracting hordes of visitors who are wishing to witness the supremacy of nature, with their own eyes. However, the officials are still not sure if it is safe to swim, as they are not too sure about the sand. As of now, the visitors are recommended to enjoy the soft sand and leave the swimming to the dolphins that frequent the area. Citizens near Dooagh hope the beach’s restoration also means the return of sand eels, a popular local fragility, which was unable to continue the inhospitable rocky environment left after by the 1984 storms. Clumps of seaweed called “the wrack” have also landed the shore again, a boon for the area’s farmers who use the briny plants to fertilize their land. Unexpectedly, this is not the first time Dooagh Beach has disappeared and restored again; it vanished in the 1890s, for over 30 years, before returning in 1927. Yet, the locals are optimistic that this time around, the beautiful sand is here to stay! !